This is my favorite post of yours ever. Even now, my husband and I refer fondly to going on a lyrical rampage. I had forgotten about burninating the countryside and peasants. Awesome. Ahhhh my friends and I were obsessed with Homestar Runner during 7th and 8th grade (2003-2004). I'm now obsessed with this post. I still have my Trogdor the Burninator sweatshirt in my closet! The bottles look like they would be perfect for making homemade liqueurs, flavored vinegars, and salad dressings, all of which would make great gifts. I have been looking for this at my local TJ since the December Frequent Flyer came out, but so far haven't had any luck. 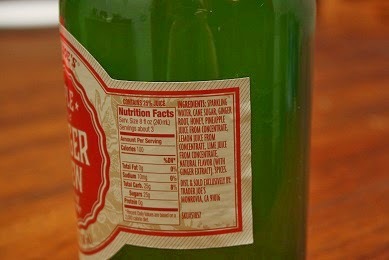 Thanks for posting pictures of the nutrition label so that I could go on an internet hunt and find that the unique ingredient profile matches that of Reed's Ginger Brew. Reed's private labeling for TJ is probably either their Extra Ginger Brew or an enhanced version of it. I see Reed's already bottles in the 750 ml size, though probably nothing as fancy as the TJ bottle. It's been a long time since I've had Reed's ginger beer, and I've never tried (or even seen) the Extra version. I'd love to hear from someone who can make the comparison. I'm sipping it as I read the post, and I'd compare TJ's Triple Ginger Brew to Stewart's Ginger Beer, which was so deliciously ginger-hot, but is no longer available. Reed's is not to my taste and this Triple Ginger Brew doesn't remotely taste like Reed's (thank ginger-goodness!). I've been yearning for hot-tasting ginger beer since Stewart's stopped making theirs because most liquids labeled ginger beer tend to be pretty tame. I'm happy to say that TJ's Triple Ginger Brew is hitting the gingery hot spot for me. This stuff is the bomb with some dark (NOT spiced!) rum and a squeeze of lime juice. Incredible dark 'n' stormy right there!! The bottle is awesome. I truly did not like the ginger brew though- which was disappointing since I enjoy that spiced-hot ginger taste. The bottle reads all sorts of really awesome ingredients- ginger, honey, lemon, etc- but this just tasted so bland. Y'know, I had more of this today, and I realized I'm not all that crazy about it. I prefer the Reed's Extra that TJ also sells. This Triple Ginger has too much honey flavor, not enough ginger bite, and the lime/pineapple hints don't quite do it for me. Not a bad beverage, but it's also not that burninating brew that I crave on occasion. This makes the best Moscow Mules EVER! Also delicious with some bourbon and a dash of orange bitters. I call it a Buffalo Mule. We absolutely love this stuff,and are so bummed that it is only around during the holidays. We found out it's because the plant that makes it literally shuts down their regular operation to makeis once a yearor TJs. This recall must not be the end of it! So, let's get back to the issue of the bottles!!! I am a budding homebrewer (of ales) and when I first saw the beautiful bottles on the TJ's Triple Ginger I decided to develop a taste for the stuff! It was an easier go for the first dozen bottles or so (this is over a three-year period), but the last 6 bottles or so (of slightly over 30) has been sitting on the shelf, full, for since December. BUT, I recently decided to start buying Rum again, and happened to look up some good rum recipes, and one was a "Dark and Stormy", which can be made out of rum and ginger "beer", similar to a Moscow Mule. 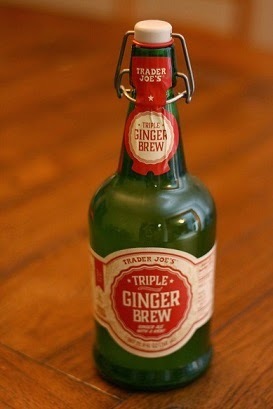 That search led to several recipes using TJ's Triple Ginger Brew! I've gotten quite friendly with a 50/50 mix of TJTGB and Rum for a quick and easy poor man's Dark and Stormy! And IF you decide not to keep the bottles, I'll send you my address and postage for my store of bottles to fill with homebrew!